Here is Nana, visiting her sister in Japan in the late 60’s. 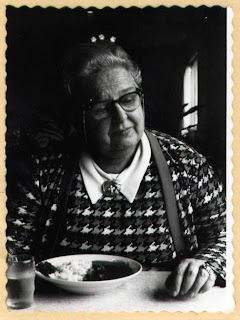 Nana loved travel, and she loved foods from many cultures. In the Sixties, American food culture was following right along, with the rising popularity of French, Chinese, Japanese and other ethnic cuisines. Home cooks jumped right in–so much so that they were imprinting familiar American dishes with more “exotic” flavors. A perfect example of this is what’s cooking today–a Chinese-style pot roast. Pretty easy, really. Make a dry rub with garlic powder, dry mustard, black pepper and salt. It looks a bit like corn meal, doesn’t it? Pat the meat dry with a paper towel and rub the spices all over the meat. Make sure you get the rub on all sides. Heat some fat in a Dutch oven. I used half veg oil and half bacon fat. Add the meat. While the meat’s browning, make the sauce: Water, soy sauce, honey, rice vinegar, celery seed and ground ginger. When meat is browned on all sides, remove and set aside. Add a thickly sliced onion and a couple ribs of thickly sliced celery to the pan with about a cup of water. Stir up all the browned bits on the bottom of the pan. Return the meat to the pan, and pour the sauce over. Turn the heat to low, cover and cook for 2-3 hours, or until fork tender. Take the meat out and let it sit on the board. Strain out all the vegetables and other junk from the sauce. Pour the sauce into a small saucepan and bring heat to a boil. If you wish, thicken it using a cornstarch slurry. Slice it and serve the jus on the side. We had it with the ‘Best Fried Rice’ and some broccolini. Yummy! A very nice and satisfying Sunday supper. In a small bowl, mix the garlic, mustard and black pepper. Pat dry the roast and rub the spice mixture over the meat. In a Dutch oven, heat the fat over med-high heat and sear the meat on all sides until well browned. While the meat is browning, make the sauce. Combine 3/4 cup of the water, soy sauce, honey, vinegar, celery seed and ginger and set aside. Remove the meat. Add the onion and celery, saute until soft. Add a cup of water to deglaze the pan. Return the meat to pan and pour over the sauce. Cover and simmer over low heat for 2 to 3 hours or until tender. Remove meat. Strain out vegetable matter. Return to a saucepan and bring to a boil and reduce. If desired, the sauce can be thickened using 2 Tbsp cornstarch to 1/4 cup cold water--mix and whisk into sauce. Serve jus alongside the roast.